How often do you back up your computer? For me, it used to be a nightly chore but I recently changed my backups to a weekly schedule. Sometimes this means that more data is being transferred to my external drive than would be if I were doing this task daily. My external drive was connected to a 2.0 USB port. It didn’t move data at a snail’s pace but it wasn’t exactly lickety-split either. 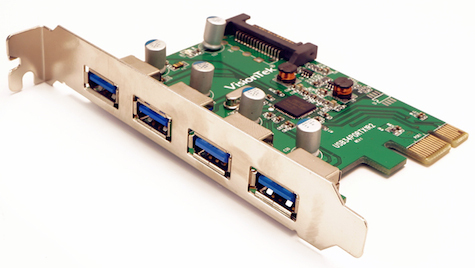 Then I had the chance to experiment with the VisionTek 4 Port PCIe USB 3.0 Expansion Card. I have a Mac Pro that dates from early 2009, and installing the expansion card took about 10 minutes. On most computers, the card will get all the power it needs from the slot to which it’s connected so all you need to do is push it down into the slot and close up the box. But my motherboard was a little different. I had to run a cable, provided with the product, from the card to a SATA port to get power. It’s a simple process that VisionTek’s support staff explained in a brief email. The four USB ports are backwardly compatible with 2.0 systems, but if you have a device that can use 3.0, plugging it into this card will produce a noticeable increase in speed. Using a 2.0 cable, I copied a 4.87GB file to my external hard drive in 2:41 minutes. Using 3.0 cable and the port on the expansion card, I copied the same file in 1.1 minutes. If you’re backing up an entire hard drive, the VisionTek 4 Port PCIe USB 3.0 Expansion Card can save a fair amount of time. There are other companies making these 3.0 expansion cards. I can’t speak for them, but the VisionTek card is reliable and easy to install. Everything you need to make the device plug ’n’ play is in the box. The price is right, and the performance is excellent. Now all you need to do is figure out what to do with those extra minutes you saved by boosting your file transfer speeds. Did you have to install any drivers? I’ve reviewed some these for my 2009 Pro and they always have a driver, which I hate.